I have just finished making these pumpkin truffles and I am totally in love. These are gluten-free, vegan and are out of this world! 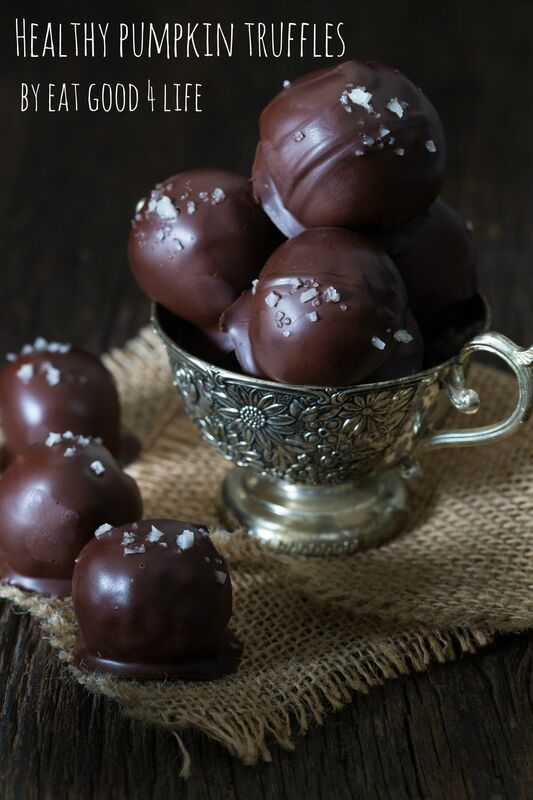 While these pumpkin truffles may be a little more involved they are just plain sensational. Worth every minute. I have not made truffles in for ever and I think these have become a favorite truffle recipe for me. While you can skip the salt on top of each truffle I thought it added a much needed taste to brake up the sweetness a little bit. It is up to you if you want to add the salt or not. As you know, I am trying to make some more pumpkin recipes for the month of September so will see what I can come up with. I have already put pancakes and waffles on the list. 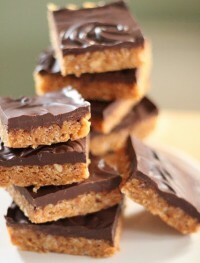 Since these are two recipes that my readers requested I will be making these soon. Stay tuned because these are going to be really good. 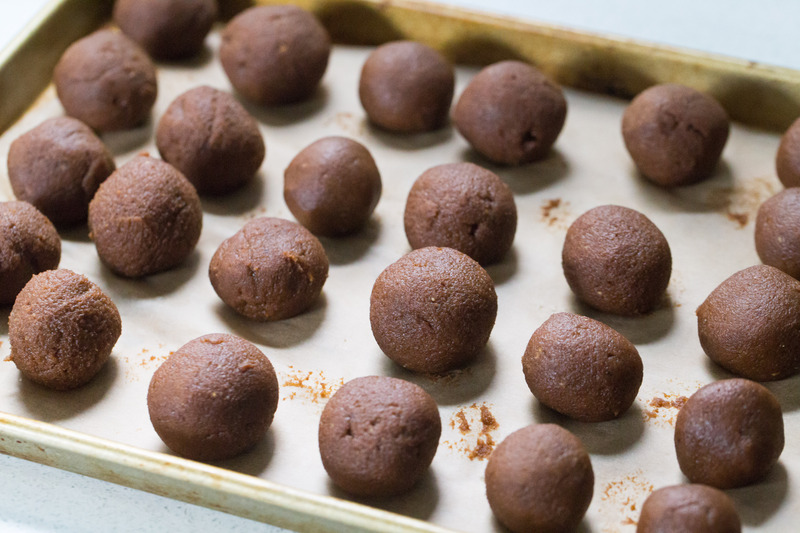 These pumpkin truffles are so good you can even have them for breakfast or as a snack. They are healthy, filling and 1-2 go a long way. The only difficulty I see with these is making the date paste since it takes a few minutes and you will have to scrape the food processor a couple of times. I have had the date paste frozen for 3 months after I made a huge batch not long ago. I didn’t know what to do with it so I just made up this recipe which turned out perfect. Sometimes I am really lucky on that department! Anyways, these healthy pumpkin truffles are out of this world. I hope you get to try them. You will not be disappointed. 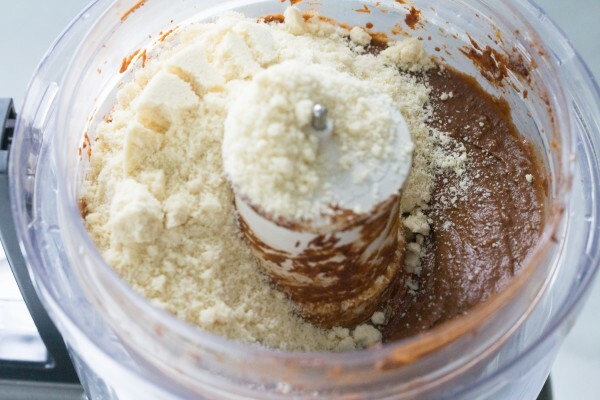 In a food processor add the pitted dates and almond milk and pulse until you obtain a creamy consistency. You may have to stop the food processor in between and scrape down the sides. Add the almond butter, pumpkin puree and spices. Pulse until you obtain a homogenous mixture. Add the almond flour 1 cup at a time and pulse in between until you have added the 2 1/2 cups. You should be able to form balls with these dough, if not add a bit more almond flour. Line a baking sheet with unbleached parchment paper. Form 25-30 dough bit size balls and place in the freezer for at least 30 minutes to harden. In the meantime, melt the chocolate and coconut oil in a microwave safe bowl at 30 second intervals until completely melted. 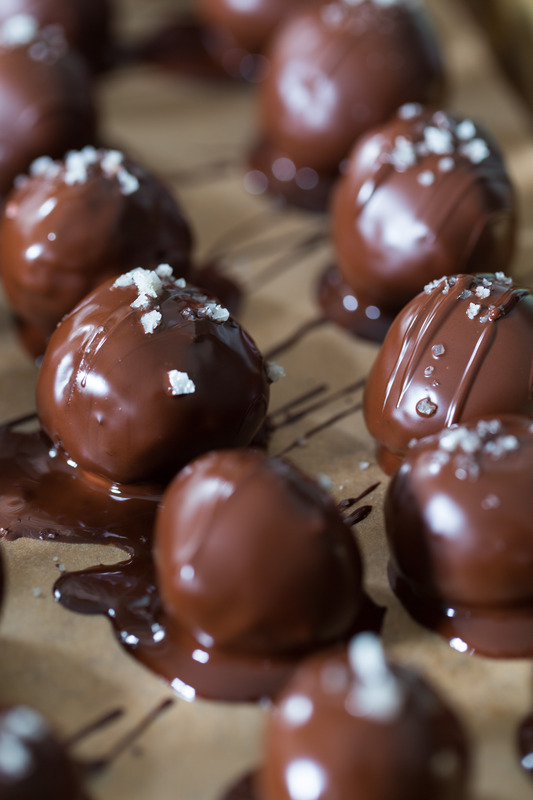 When the balls are cold enough, dip them, one by one into the melted chocolate. I used two forks for this step, and place them in the prepared baking sheet. 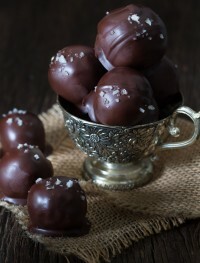 If using, place some coarse celtic salt over each truffle piece immediately after dipping it in chocolate. You need to do this now otherwise the chocolate will solidify and the salt won't stick. Place back in the fridge of freezer for the chocolate to solidify. Keep chocolate truffles in the fridge. 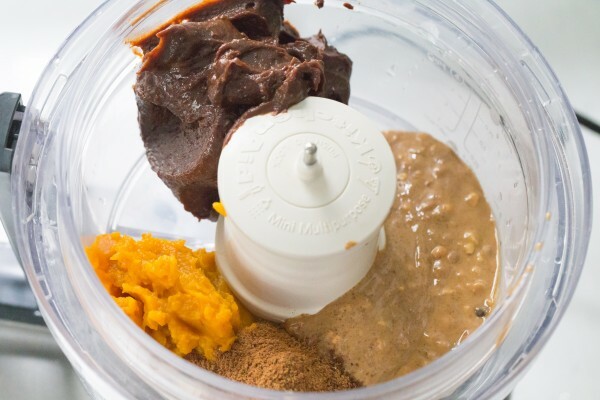 NOTE: If you don't have pumpkin spice you can make your own by mixing 2 tsp cinnamon powder, 1 tsp clove powder, 1 tsp ginger powder, 1 tsp nutmeg powder. p.s. i used your valentine’s cookie recipe to make easter cookies last week and they are wonderful – almost taste like shortbread! thank you! I just love this oatmeal. I am going to make other versions soon but the next one that I really want to try is an apple pie version. I am sure bananas, nuts and dry fruits are also awesome with oatmeal. 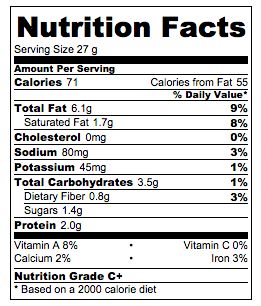 Nutrition facts: Thank you so much! I am a type 1 diabetic and I have to match my insulin dose to how much carb I am eating, exactly how many grams of carb. So for me the nutrition facts are not judgmental or “policing” but helping me know how to keep myself healthy. While I do calculate carbs on my own, since so much is at stake, it is helpful to know how someone else counted it, double checking is good! Especially if its something I’ve never eaten before and thus have no idea how to count it. Thanks again, I really appreciate it! 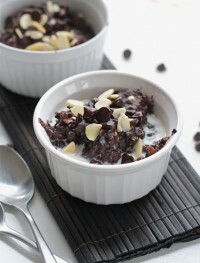 this looks so good, omg, i’ve made chocolate peanut butter oatmeal, but man, not like this. this is like DESSERT. gorgeous pictures! I know that for diabetics carbs are very important. I am glad you are able to use them, this is one of the only times where I think having nutrition facts is crucial as diabetics can make their calculations and figure out how many carbohydrate exchanges they are consuming. This looks so delicious! I’ve made chocolate oats before, but I need to do it again soon. I’m wondering if oatmeal for dinner would be acceptable, haha. Hi there Ive just recently discovered your blog and I do love it!! For this recipe I do wonder how it can be called super duper healthy when almost half the calories come from fat? Fat is not all bad. BAD FATS ARE SATURATED FATS PLUS TRANS FATS (HYDROGENATED FATS). There are good ones such as polysaturated and monosaturated fats. If you look at the nutrition facts there are only 4.4 grams coming from saturated fat and the remaining which are 16.8 grams are good fats so this is not bad, it is good. Plus the grade for the recipe is A-, if all of the fat was coming from the saturated type this would have not gotten an A- grading!! People get concentrated on seeing that the fat content is large and then just assume that the recipe maybe bad, but you have to deeply analyze what the fat composition of the recipe may be. If all, or most of all, is coming from saturated fat, then it is bad, which is not the case here. If you want to decrease the saturated fat amt here just decrease the amt of chocolate chips to half in the recipe and you will have less saturated fat, 2.2 gr to be exact :-) The carb content will also go down. To be exact there are only 40 calories coming from saturated fat. I am glad you found my blog. Hope you keep coming back. Thanks, I never noticed the grading on the label, must pay more attention. Of course I’ll be back, I like a lot of your recipes. This is literally one of the best things I have ever seen. Yum. 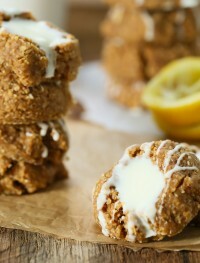 I love reading blogs with healthy and exciting recipe. You can see how healthy person makes creative and exciting healthy food. Good job! How do you make 1 serving? I’m the only one who eats oatmeal here, lol. Hi… Was wondering about the type of oats used here… Can I use regular quick cook oats or should I used rolled oats? Cos the latter does take longer to cook but is way healthier . And another question .. I have flax seed powder in d fridge , is it the same as the meal version U mentioned? Sorry! Not really familiar with these ingredients ! Thanks!